While what is now our island was still joined to the continent another great improvement was made in human methods of destruction. Copper and tin were discovered and worried out of the earth; the one too soft the other too brittle for the main purpose, but, blended by human genius, they opened the age of bronze. Other things being equal, the men with bronze could beat the mean with flints. The discovery was hailed, and the Bronze Age began. Putting Churchill’s dodgy timelines to one side in favour of literary merit (Britain was disconnected from the continent by the English Channel long before the Bronze Age), this prose neatly captures the sometimes revolutionary impact on warfare of developments in technology. Reinforcing the point, two pages later Churchill summarises another technological revolution in military affairs—and another sweep of history—with a chillingly efficient sentence: ‘Men armed with iron entered Britain from the Continent and killed the men of bronze’. A little more digging around led me to this essay on the impact of science and technology on war fighting. For the purposes of this week’s graph, I’ve redrawn one of the figures in the article to make the trends under discussion clearer. 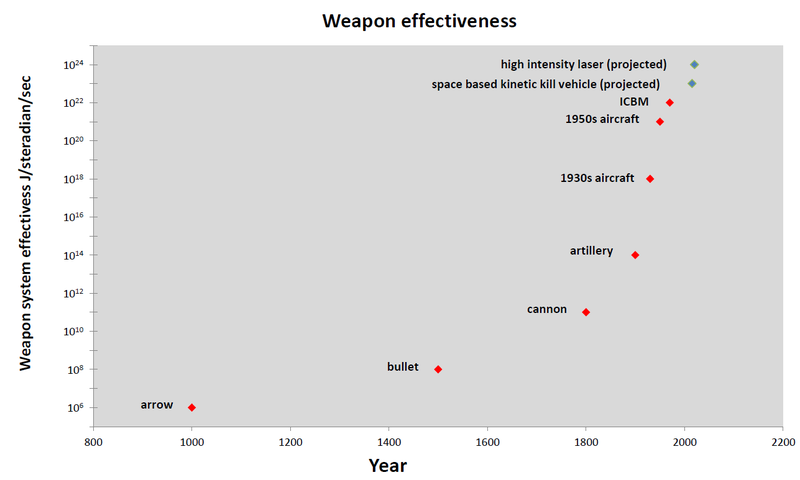 Figure 1 (click to enlarge) shows the steadily increasing effectiveness of weapon systems since 1000 AD. The measure of effectiveness here is the amount of energy delivered per solid angle per unit time—in effect a hybrid measure of the terminal effect of the system, the time taken to deliver that effect and its accuracy. We can argue a little about the way the numbers are calculated but the basic point is sound—there has been a breathtaking rate of increase in lethality and the swiftness and accuracy with which it can be delivered. There was about two thousand years between Europeans mastering bronze and iron, and the difference in battlefield effectiveness between those technologies was many times less than some of the later changes, which occurred on much smaller time scales. That’s mostly because the terminal effect was the only factor that changed—it still took months to assemble an army and march it into position, and weapon accuracy still depended on the skill of its user. But in the twentieth century alone, weapons have increased in effectiveness by a factor of one hundred million by this compound measure. 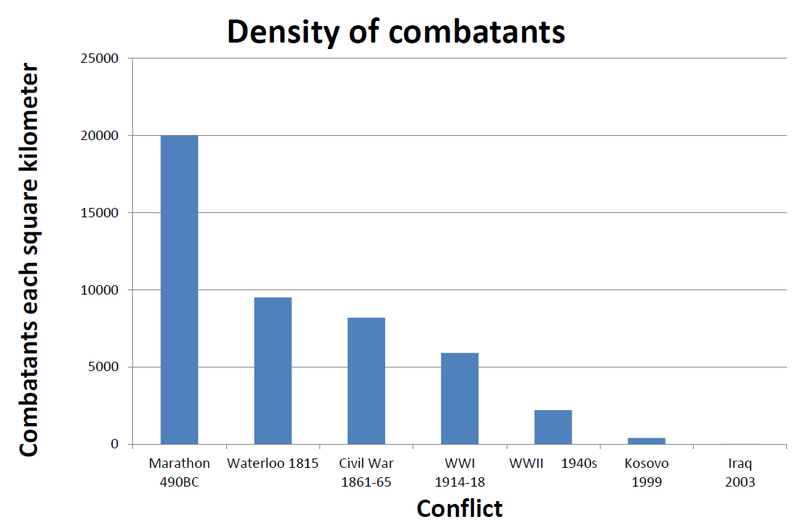 Another graph (click to enlarge) shows one result of these developments—a dramatic decrease in the number of combatants who can assemble on the battlefield with any degree of safety. Simply put, when faced with modern weapons, the battlefield is too dangerous for any significant assembly of personnel. Sources: The figures for Marathon and Waterloo are estimated from battlefield maps and the reported size of the armies involved. The other figures are from the essay mentioned in the text. Andrew Davies is senior analyst for defence capability at ASPI and executive editor of The Strategist.